In Scotland, the word "stay" has a slightly different meaning than in rUK. Here, where you "stay" is where you live. 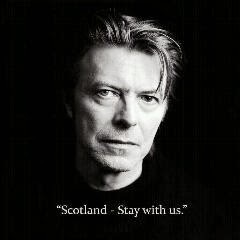 David Bowie does not "stay" in UK. He is a tax exile who stays in New York and Switzerland. Kate Moss nervously read, while dressed in David's babygrow, "Scotland stay with us." Was the leftfield tongue in cheek ex-Nazi supporter, when he sent his catwalk model servant to the English... I mean "Brit Awards," to make his political opinion known, offering Scots a holiday in one of his many foreign homes? A wee trip abroad with the man with cocaine holes in his brain? Personally, it would be a holiday in hell. He is a tad pretentious. Imagine lying by his pool while he constantly warbles a new song about being in space with Richard Branson flying in a balloon, mixing up the lyrics to make his nonsense sound even more pretentious? Not for me. But I might be tempted to stay with Tory tax exile, Michael "blow the bloody doors off" Caine, or the other American tax exile Londoner Rod "Ark Royal" Stewart. Even Skeletor-like Tory Mick Jagger, who also decided his taxes were better paid towards the Vietnam war than the NHS has a cool friend who might drop by if I was to stay with him. Which aging English rocker or meeja star would make me think to vote no? None to be honest. But glad to hear the sense that Billy Bragg brings to the debate.